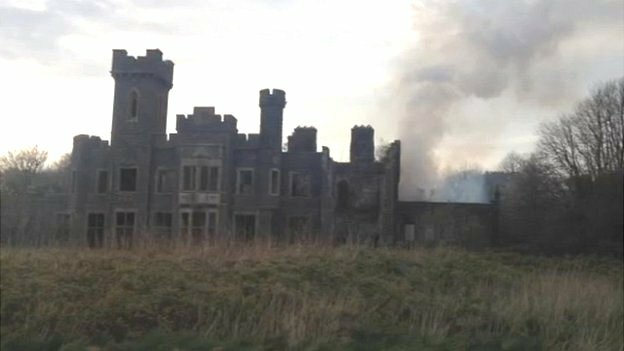 The remains of 19th Century country house that was gutted by a blaze more than 30 years ago has been hit by fire again. Plas Gwynfryn, at Llanystumdwy, near Criccieth, Gwynedd, was once the home of Conservative MP Hugh Ellis-Nanney but was destroyed by fire in 1982. North Wales Fire and Rescue Service said the ground floor of the derelict manor house was "well-alight". Crews from Porthmadog, Nefyn and Pwllheli were called around 16:50 BST. In 2011, the house was one of nine historic Welsh buildings whose heritage campaign group Save Britain's Heritage said were at risk of being lost. It will take seven years and £700m to get roads in Wales back to a reasonable condition, a study reveals as the Welsh Government announces £28m for local transport projects.